An Ethernet is primarily a group of LAN technologies which are covered in IEEE 802.3 u standard. The ethernet is easily maintained and managed and considered to be low-cost network implementation solution. It comes in three variations, 10Base-T ethernet, fast ethernet and gigabit ethernet. 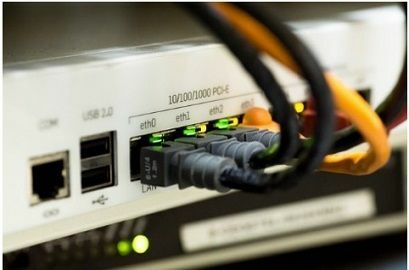 The main difference between fast ethernet and gigabit ethernet is the contradicting speed where fast ethernet provides at maximum 100 Mbps of data transmission speed whereas gigabit ethernet offers high-speed data transmission up to 1 Gbps. Basic Offers 100 Mbps speed. Provide 1 Gbps speed. Delay Generate more delay. Less comparatively. Configuration Simple Complicated and create more errors. Coverage Can cover distance up to 10 km. Has the limit of 70 km. Relation Successor of 10-Base-T Ethernet. A successor of fast Ethernet. The fast Ethernet was devised under the name of 802u to contend for LAN protocol FDDI. It is completely based on 10-Base-T ethernet as it is a successor of 10-Base-T Ethernet. It was popular because it is simple to implement, manage and maintain. The fast ethernet has the advantage of backward compatibility. It is ten times faster than its successor and is capable of providing data speed of 100 Mbps. There are three varieties of fast ethernet – 100Base-T4, 100Base-Tx and 100Base-Fx. MAC layer of fast ethernet is different from the standard ethernet where the data rate and collision domain are altered. The data rate is incremented by the factor of 10 and collision rate is decremented by the factor of 10. Although, there exhibit no change in frame format, then how did it achieve ten times faster speed without changing frame format? To accomplish this, the RTT (Round trip time) has reduced from 57.6 to 5.76 microseconds. The time needed for a signal pulse or a packet to traverse from a certain source to a particular destination and return from there again is known as Round trip time or Round-trip delay. The Gigabit Ethernet was devised to provide a higher rate of transmission up to 1 Gbps. The prior intention was to develop a technology that can properly work on existing networking equipment. It is constructed on the top of the Ethernet protocols such as CSMA/CD. Both the modes full duplex and half duplex are supported by it, similar to fast ethernet. In the beginning single-mode, multi-mode fibre and short-haul coax cable are used. After that, twisted pair cable standards were also included. Gigabit rates are achieved by using physical channel technology as a standard over the optical fibres. The fibre optic cable is majorly used instead of coaxial cable and twisted pair cable. MAC layer has also modified in gigabit ethernet. It uses carrier extension to detect frames coming from a larger distance. To manage flow control the X-on/X-off protocols are used, that work over any of the full-duplex Ethernet. This helps in stopping the transmission when a switch buffer is near to its capacity. The quality of service (QoS) is supported by gigabit ethernet with the help of signalling scheme so that the real-time packets get the better treatment. The data rate provided by fast ethernet is up to 100 Mbps. On the other hand, gigabit ethernet offers up to 1 Gbps speed. As the speed is increased in Gigabit ethernet, so the delay is decreased whereas the fast ethernet generates more delay. The configuration of fast ethernet is simpler than gigabit ethernet. The distance covered by fast ethernet is at most 10 km. On the contrary, the gigabit ethernet covers 70 km. Round trip delay of fast ethernet is 100-500 bit times. As against, gigabit ethernet has the delay of 4000 bit times. Fast Ethernet and gigabit ethernet are the types of ethernet where fast ethernet is slower than gigabit ethernet and provide maximum data speed up to 100 Mbps. On the other hand, the gigabit ethernet has extended its speed at maximum to 1 Gbps by improving cabling technology, MAC layer, flow control protocols and quality of service.